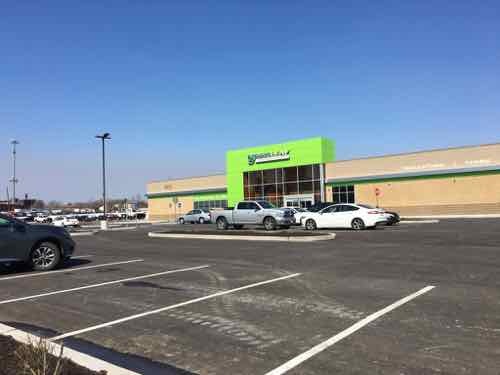 After years of waiting, two businesses are open within Paul McKee’s Northside Regeneration redevelopment area —- part of a carefully crafted area to get millions in state & local tax credits. ZOOM Gas opened last Fall, GreenLeaf Market opened earlier this month. Both will hold a grand opening this Saturday (4/13) 10am-3pm. In the recent non-scientific Sunday Poll readers were split on supporting these new businesses. This confirms my conversations with others. 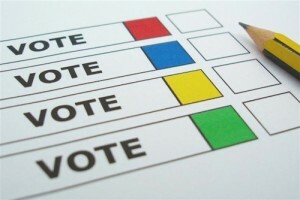 Q: Agree or disagree: To protest Paul McKee I won’t spend money at ZOOM Gas or GreenLeaf grocery store. I’m torn on this subject, though we’ve been buying gas at ZOOM since moving nearby. We’ve bought a few items at GreenLeaf. Though I have a strong dislike for how McKee conducts business, I want these to succeed. The people need the work, neighbors need nice places to shop, and the last thing we need is more vacant suburban-style buildings. Both are at the intersection of Tucker/13th/O’Fallon. On Monday I took you back through years of looking into various shell companies involving hundreds of properties, many acres, and lots of secrecy — up to the public reveal in late May 2009. If you missed it, see Before It Was Officially Named NorthSide Regeneration, We Knew It As ‘Blairmont’. That Fall, during the Board of Aldermen’s 2009-2010 session, two bills (BB218 & BB219) were introduced by then 5th ward alderman April Ford-Griffin and 4 co-sponsors: Freeman M Bosley Sr.(2nd), Kacie Starr Triplett (6th), Phyllis Young (7th), and Marlene E Davis (19th). Of these 5 aldermen, only Marlene Davis is still in office. Online voting records only go back to 2015, so I can’t tell you who, if anyone, voted against these bills. 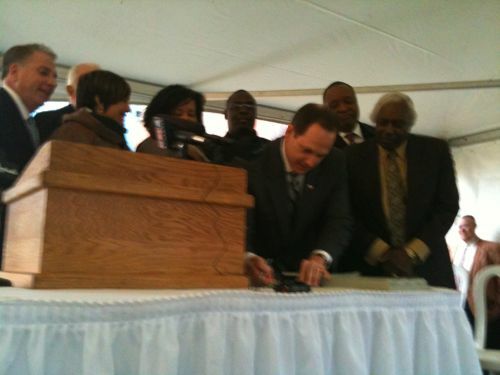 St. Louis Mayor Francis Slay signs 2 bills for Paul McKee’s NorthSide Regeneration project on November 10, 2009. In November 2009 Mayor Francis Slay signed the two bills at an event held in front of the Clemens Mansion, which was going to be rehabbed by state tax credits (low income and/or historic) didn’t come through. The still-vacant property burned on July 12, 2017. 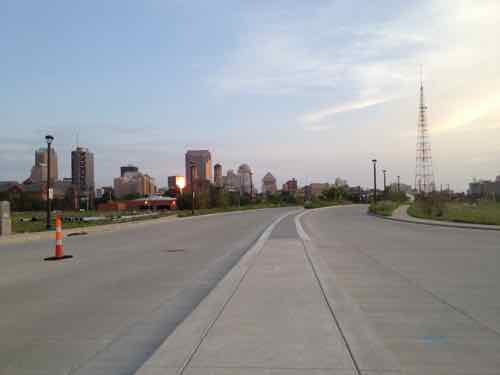 I was there whenPaul McKee & Mayor Slay kicked off NorthSide Regeneration, here’s there comments that day. After the two bills became ordinances, lawsuits were filed, more legislation passed with more tax credits and so on. 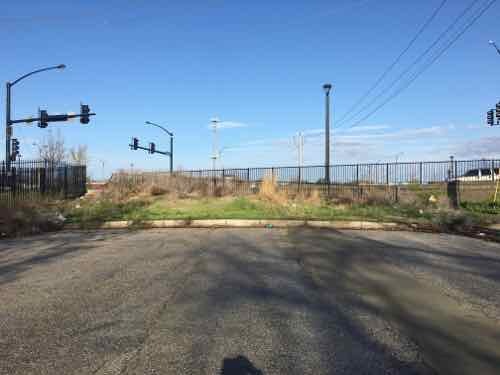 In the meantime, the National Geospacial-Itellegence Agency (NGA) picked a sparsely populated area North of the old Pruitt-Igoe site for their new West headquarters, relocating from South St. Louis. 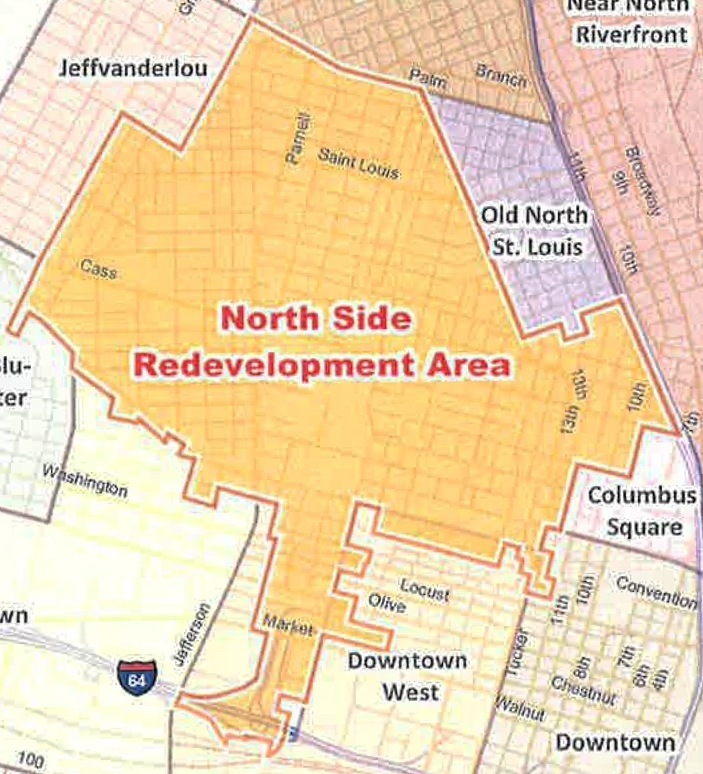 See New NGA West Location Will Gut St. Louis Place Neighborhood, Not Revitalize What Remains. 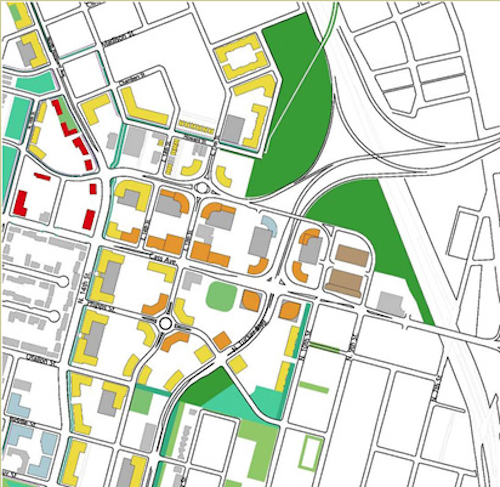 As mentioned on Monday, the 5th Ward master plan, adopted in 2002, designed the area for new development. I’d planned to share my thoughts on what St. Louis should do next now that McKee’s project has collapsed, but that’ll need a separate post. So Monday won’t be about all the issues frim the past 15 years…it’ll be about the next 15 years as I think they should go. With the news last week that the City of St. Louis now considers developer Paul McKee’s NorthSide Regeneration project in default and Missouri suing him for tax fraud, I got to thinking about how we got here. Blairmont owns many properties on the Near North Side of St. Louis and is notoriously hard to reach. No one can find out anything about Blairmont except that a man named Harry Noble supposedly owns the company — but even that isn’t verified. A search through the Missouri Secretary of State’s corporation registry reveals that the “CT Corporation System” registered the name “Blairmont Associates LC” on behalf of an anonymous party or parties. 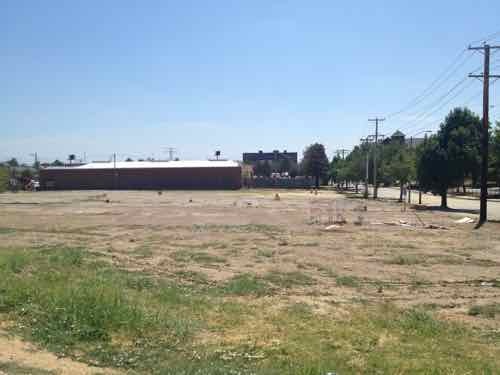 Many of Blairmont’s properties seem to be vacant lots in Old North St. Louis, St. Louis Place and other neighborhoods, although the company recently purchased a vacant St. Louis Public Schools property at 2333 Benton. Other people report needing to make agreements with Blairmont to repair shared utilities or utilities that run through Blairmonnt properties, and having difficulty finding a phone number. If you know anything about Blairmont, please post a comment here and maybe we’ll be able to help Lyra and others who are interested in contacting the company. In the above post Allen lists how many properties were owned by each entity. At the time I was in real estate so I could look up all the properties owned by name. Using Allen’s list of names we were quickly able to create a list of hundreds of properties involved. The data was exported in XLS format so he could create a master spreadsheet. 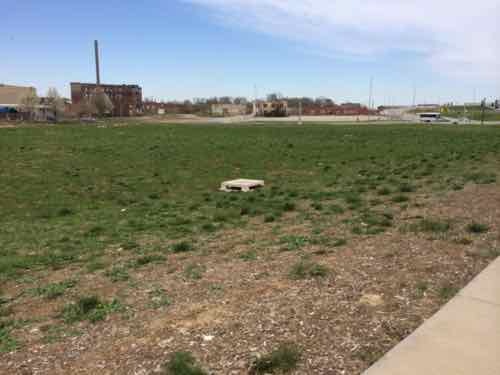 In the meantime, BJC Healthcare was wanting development rights to Hudlin Park — a former piece of Forest Park with their underground parking garage. The local neighborhood group, for which the park was a part of, was to hold a meeting on BJC’s plans. 1) Hatch evil plan around self interests but tied concerns about higher taxes if not accepted. 2) Get politicos on board with plan. After all, that is why we give them contributions! 3) Get local group on board now that they are used to our annual grants. 4) Oh yeah, almost forgot, hold some sort of public meeting now that all the decisions are made. Solicit “input” without laughing. 5) Wrap up song & dance and return to doing whatever we feel like secure in the knowledge the alderman and neighborhood are eating out of our hands. What a system we’ve got. Michael Allen has tracked the company’s comings and goings on his Web site, www .www.eco-absence.org. He says that the Blairmont group of companies (which operate under names such as VHS Partners, N&G Ventures and Noble Development Company) has accumulated nearly 400 properties — more than 1,000 acres — in the Fifth and Nineteenth wards. “They show no signs of slowing down,” says Allen. Among Blairmont Associates’ properties are the historic James Clemens Jr. House at 1849 Cass Avenue, which is a stately-but-crumbling mansion, and the Brecht Butcher Supply Company buildings at 1201-17 North Cass Avenue, which were gutted by fire last October. Residents first identified Blairmont as a neighborhood force about three years ago, says Sean Thomas, executive director of the Old North St. Louis Restoration Group. The nonprofit group, which was established in 1981 to help revitalize the area, grew uneasy because Blairmont didn’t seem concerned with upkeep. Although I’d read about Blairmont, and worked behind the scenes with Michael Allen on identifying properties, I hadn’t written about it…yet. 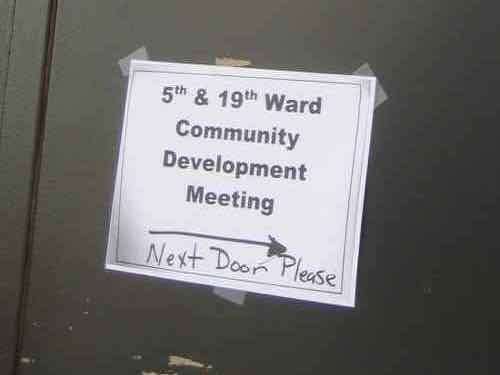 Well today the plan was offered to select attendees at meeting on the North Side. The press wasn’t allowed and even Steve Patterson of Urban Review STL was asked to leave as a member of the press. Well, well, bloggers have come a long way huh? Commercial centers located near 22nd street & I-64, Jefferson & Cass, Jefferson & Natural Bridge, and the new I-70 bridge terminus. So what’s missing? Just developers and financing, that’s all. It appears as though McKee will be asking for concessions from just about everyone and I’m not sure that people are clamoring for development on the north side enough to give him carte blanche. This is just the first word, but it appears that the potential $400M TIF will be up for a vote as early as this coming Friday. Yes, I was asked to leave a meeting. Never mind that where I lived then is where I live — which became part of the 5th ward after the last redistricting. I got into my wheelchair , left the meeting, and joined the press outside. I think because of this academic background I’m able to step aside from my anger at the loss of the warehouse at Cass & Tucker and the many other reasons so many are angry. Three years ago my reaction would have been quite different. So what do I think of the plan now that I’ve had a chance to see the proposal? McKee’s plan calls for four job centers — large sites suitable for one or more companies to have a new campus setting. No surprise here, this is what McEagle does in suburban areas. This is a chance to get these jobs (and taxes) in the city. I’m going to stop here for now, I’ll continue on Wednesday and share my thoughts on what St. Louis should do next. 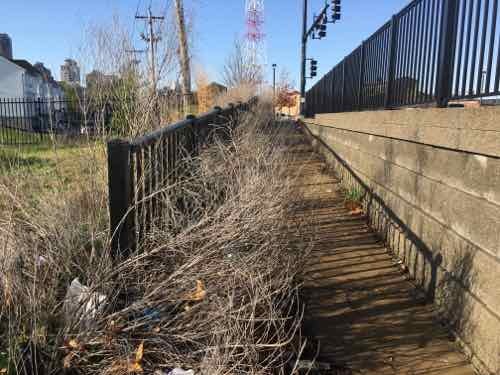 Sunday Poll: Any Hope of Reviving North St. Louis Without Paul McKee? June 17, 2018 Featured, NorthSide Project, Sunday Poll Comments Off on Sunday Poll: Any Hope of Reviving North St. Louis Without Paul McKee? Developer Paul McKee had a bad week last week. In a letter filed Tuesday, city officials say it’s time to face facts. “After a decade, the promised redevelopment has not come, nor is there any indication that it will,” the letter states. “Land lies fallow. Taxes go unpaid. 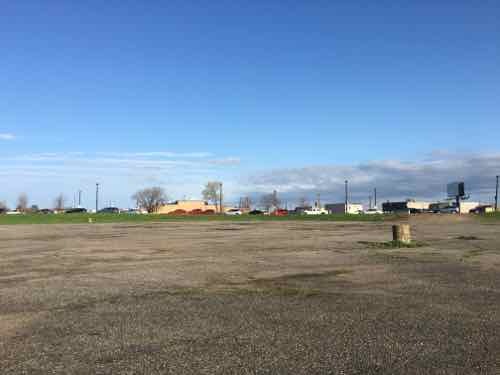 Vacant buildings remain dangerous and unsecured….these are not the results the City bargained for when it granted Northside redevelopment rights for the Area,” the letter reads. Missouri Attorney General Josh Hawley filed on Wednesday a lawsuit against developer Paul McKee’s NorthSide Regeneration LLC, alleging the company kept $4.5 million in state tax credits despite failing to complete the purchase of more than $5 million worth of properties in north St. Louis. This poll will close automatically at 8pm tonight. Come back Wednesday for my thoughts. New buildings were shown up to the streets, with parking behind — the way we should be things in the center of the region. Someone may drive to work, but it makes walking to lunch, for example, feasible. Constructing new buildings back behind surface parking is typical suburbia — it has no place in the urban core of the region — not minutes from the Central Business District. Years ago Paul McKee said he wanted to build walkable urbanism — not the drivable suburbia he was known for. Last week he presented a plan for two new buildings, one on each side of Tucker, that are highly suburban in their site planning. 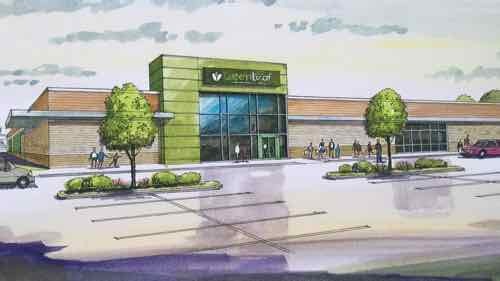 The GreenLeaf Market will be located at 1408 N. 13th St., not far from the Stan Musial Veterans Memorial Bridge. 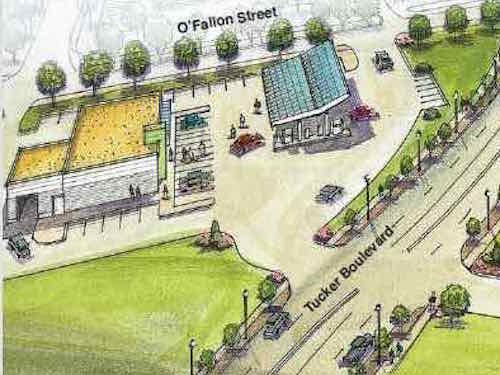 Right across the street, McKee said there will be the ZOOM Store — a gas station, store and car wash. 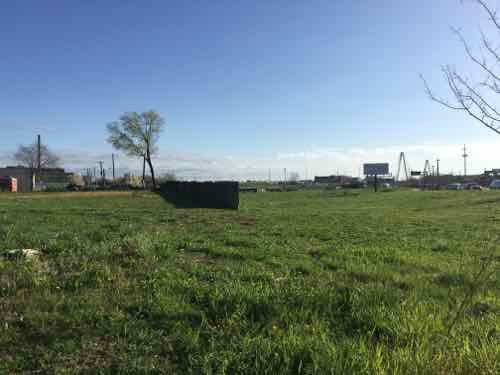 The worst-case scenario has come true — McKee is planning to build suburbia within minutes of the central business district. Not the pedestrian & transit-friendly vision he initially communicated. View as motorists drive up to the pumps. 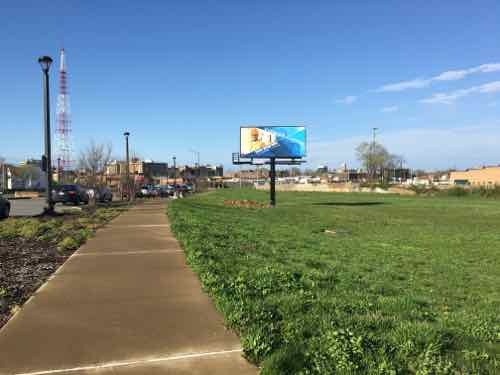 Both would be easy to have a pedestrian access route to a side street — ZOOM to O’Fallon and GreenLeaf to 13th. Technically achieving the bare minimum required by the Americans with Disabilities Act (ADA) is still a long way from being pedestrian-friendly. I’ve defended McKee’s efforts to build new urbanism in areas such as the 22nd St Parkway interchange, Pruitt-Igoe, and Tucker & Cass. That was based on him indicating his intention to do something positively urban, not ordinary suburban. These first buildings will set the pattern for this area. I knew from my earlier visits that O’Fallon St no longer connected to Tucker. 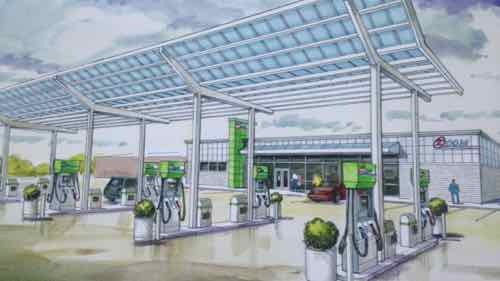 Is this to change if the gas station gets built? View looking toward Tucker from the site of the proposed gas station. 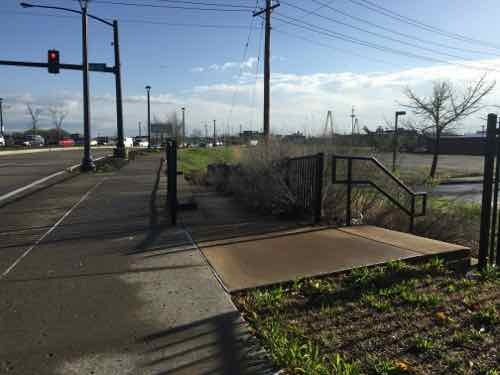 How we begin building on these large swaths of land matter, we need to ensure people can walk from building to building in the most direct manner possible — not some circuitous route or through surface parking lots. 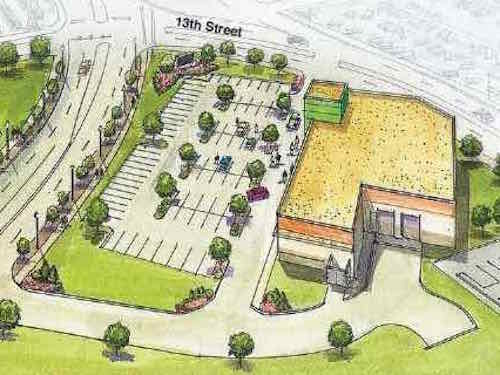 I’ve already contacted Good Natured Family Farms to tell them I welcome a grocery store — but not in a suburban form.